Sometimes I want to just make a simple dessert...nothing fancy...no sprinkles or rosebuds or swirls or extra toppings. 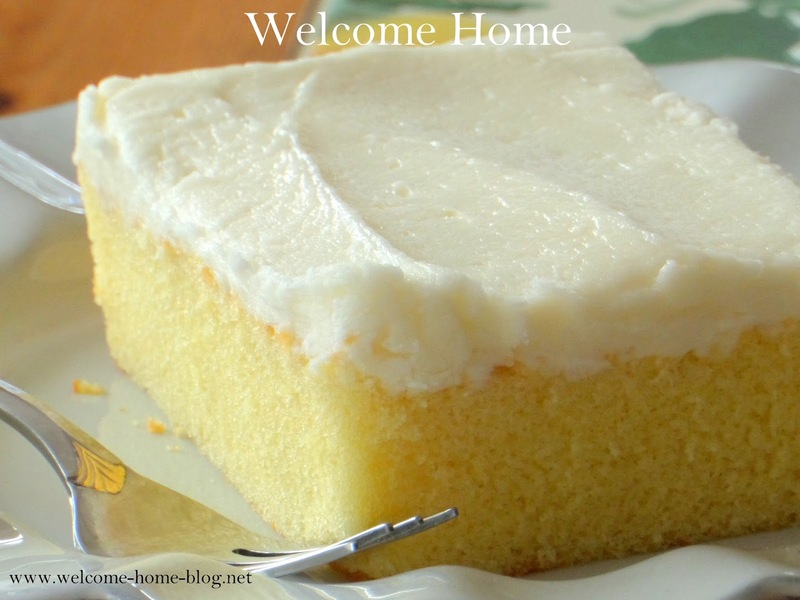 Just a delicious moist cake with butter cream frosting like my Mom used to make. This is her recipe for one of my favorite cakes. I like to put it in the fridge and eat it cold! Put butter and water in a large bowl. Heat in microwave for 2 minutes. Stir until butter is melted. Add sugar, flour, salt, and soda. Stir with a wire whisk until smooth. Add eggs and vanilla, beat well. Stir in sour cream until all is blended. Pour into a 11 x 17 baking sheet that has been lined with parchment paper and then sprayed with non stick spray. Bake at 350 degrees for 25-30 minutes, until cake springs back when lightly touched or toothpick inserted in center comes clean. Melt butter and evaporated milk or cream for 3-4 minutes in microwave. Add powdered sugar, vanilla, and a dash of salt. Beat until smooth. Spread on cooled cake.